We are proud to present the Quarterly April Issue! The new issue of Quarterly is now available. 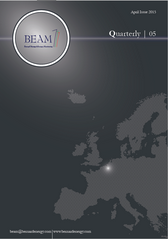 The Quarterly provides an in-depth overview of key EU energy policies relevant to the electricity sector, including a recent developments, a timeline, background information and relevant stakeholder positions, from associations such as EURELECTRIC, ENTSO-E or CEER. Where appropriate, a BEA commentary on the topic is also included. In addition, the Quarterly contains a section on the evolution of current energy-relevant case-law at EU level. On behalf of all the BEA&M staff, we thank you for your interest. ` Enjoy the read!